In a medium mixing bowl beat shortening and butter for about 30 seconds. Dissolve coffee crystals in 1 tablespoon warm water. Add to butter mixture along with 3/4 cup of the white flour. Then add the whole wheat flour, brown sugar, egg, baking powder, cinnamon, vanilla, and salt; beat well. Beat in remaining flour. Divide dough in half and chill about 3 hours or until easy to handle. On a lightly floured surface, roll each half of dough to 1/8 inch thickness. 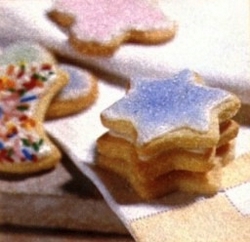 Using 2- 2 1/2 inch cookie cutters, cut dough into desired shapes. Place 1 inch apart on ungreased cookie sheets. Bake at 375 degrees for 7 to 8 minutes or till edges are firm. Cool and frost or decorate as desired.